When Dale Earnhardt Jr. straps into his seat for 500 laps of intense racing action at the Bass Pro Shops NRA Night Race on Saturday, Aug. 18, it will be in a new location at the historic short track. Instead of inside a NASCAR stock car, where he's done great work for the past two decades, he will be in a booth perched high atop The Last Great Colosseum providing analysis, commentary and fun insights as part of the broadcast team for NBC Sports. Only a few weeks into his new role and Earnhardt Jr. is already creating plenty of buzz for the sport he's so passionate about. But that shouldn't be a surprise for longtime fans of Bristol Motor Speedway. In his first race with mic in hand, he created quite a stir during the closing laps at Chicagoland Speedway as Kyle Busch and Kyle Larson battled side by side for the victory. Earnhardt Jr., up on his feet in the booth, excitedly threw out the phrase "Slide Job" as the 18 and 42 cars exchanged the lead multiple times as they approached the checkered flag. His call quickly became a social media sensation, immediately leading to plenty of copycats online doing their own impersonations of his "Slide Job" call. 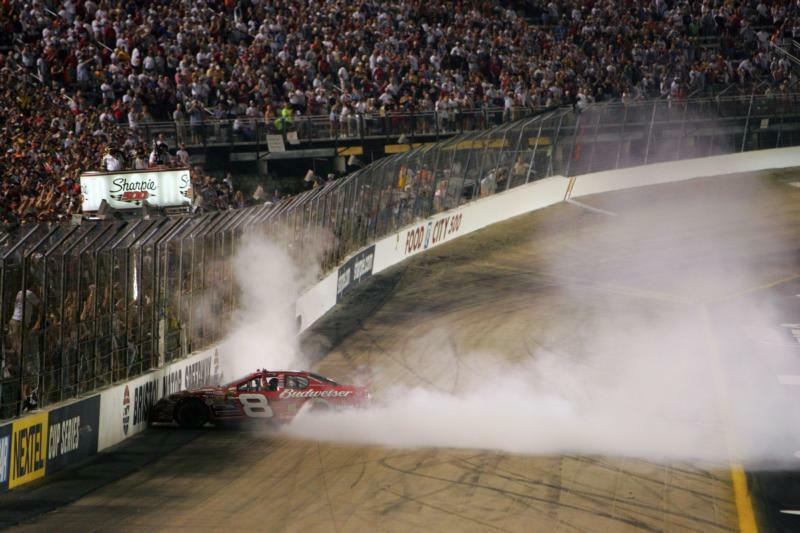 After Earnhardt Jr. won his only Monster Energy Cup Series race at Bristol Motor Speedway at America's Night Race in 2004, he famously established one of the most repeated catchphrases in BMS history when he told the TV reporter interviewing him in Victory Lane why he was so excited after earning his first win at The World's Fastest Half-Mile. "It's Bristol, baby!" Earnhardt Jr. said with a yell. Today, that phrase adorns bumper stickers, T-shirts, coffee mugs, and other memorabilia. To honor the important moment, BMS established a landmark sign that sits at the facility's north entrance and gives fans a great selfie photo opportunity. Earnhardt Jr. just seems to have a knack for saying memorable things at the right time. That's why he's proving to be a natural in his new job at NBC Sports. The race will air Saturday (Aug. 18) night at 7:30 p.m. on NBCSN. In a race where tempers flare and sparks tend to fly, and at a track where he once played in the infield as a youngster as his father claimed multiple victories, Earnhardt Jr. should have plenty of opportunities to deliver yet another famous catchphrase as the action heats up at the all-concrete high-banked half-mile. He says the transition from Cup's most popular driver to NBC Sports NASCAR racing analyst is going well. "It's been really smooth so far," Earnhardt Jr. said. "You know, no big hold-ups or speed bumps or no real huge surprises. But my teammates in the booth have been real supportive and helpful, and the entire staff at NBC has been incredibly helpful. There's no stupid questions it doesn't seem, and they're full of information." And now that he's a full-fledged member of the media corps, he looks at things somewhat differently when he's at the racetrack. "When I was a driver, I didn't like being mixed up in rivalries, and I tried to fly under the radar and didn't want to be front-page news all week with a dust-up with another driver," Earnhardt Jr. said. "Or be in any type of disagreement or conflict and didn't like to be the story all week leading up to the next race or any of the videos coming up for the next race's promotion about me and some other driver running into each other." He understands how a driver disagreement from some friendly beating and banging on track can lead to watercooler talk, social media explosions and ultimately greater exposure for the sport. "But now that I'm on the media side," he continued. "I understand what the purpose behind that type of promotion is and why the media exercises to share that with fans and help them understand the story lines in the sport. That's so critical, and I just didn't see it that way as a driver." Earnhardt Jr., who won 26 times in his Cup Career and developed one of the sport's largest fan bases in history, also boasts one of the largest social media followings among motorsports personalities. His personable presence seems to be what the fans really enjoy. He has been encouraged by NBC executives to employ the same demeanor when he's talking to the audience from the TV booth. "The best part about it is that Sam Flood [executive producer and president, production NBC and NBCSN] says just be yourself, and I keep asking him if that's really what he wants because that sounds a little bit too good to be true and a little bit too easy," Earnhardt Jr. said. "But that's what they expect out of you, and that should be very fun, to get up there and just watch races and react." He says there's been immediate chemistry with his NBC NASCAR broadcast team, including Rick Allen, Steve Letarte and Jeff Burton. "All the guys in the booth are such huge fans of what we're seeing, it's going to be a lot of fun just doing that, sitting around and talking about what's happening on the racetrack," he said. "I'm excited to learn a lot and get to know my teammates even better. "I think we just have to talk about what we see on the racetrack, talk about the action, have energy and genuine passion about what we're seeing and what's happening in front of us, and I think that'll come across to the viewer and make the viewer feel like they're watching something unique," he continued. "I've always felt like that the broadcaster has an incredible responsibility to make — to engage with the viewer and make the show entertaining and point out what about the show is exciting." Speaking of excitement, there are four races scheduled during three nights of racing at the Bass Pro Shops NRA Night Race weekend, including action in the Whelen Modified Tour, Camping World Truck Series, Xfinity Series and the Monster Energy Cup Series. During the Cup race, you'll get to see all of your favorite drivers doing what they do best, including Bristol dominator and defending winner Busch, his arch-rival Larson, rising star Ryan Blaney, 2016 Night Race winner Kevin Harvick, Daytona 500 winner Austin Dillon, defending series champ Martin Truex Jr., second-generation star Elliott, Erik Jones, Brad Keselowski, Denny Hamlin and Bubba Wallace.